Designed for portability and convenience, our versatile air-cooled portable air conditioners set up in minutes and their rugged design rolls easily from shop floor to indoor office areas. These units are ideal for a/c failure or planned maintenance, and spot or supplemental cooling of data centers, production areas, temporary facilities, and special events. These units operate at office friendly sound levels. 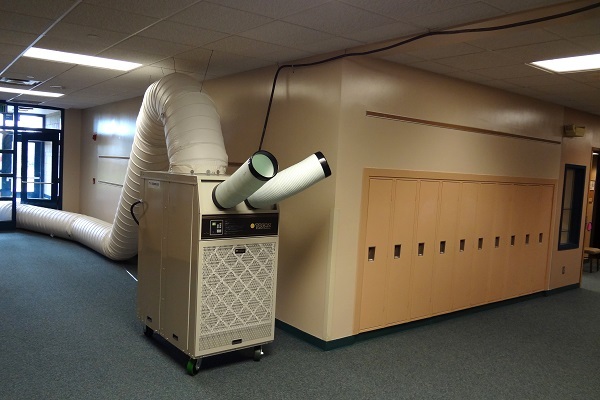 Water-cooled portable air conditioners do not require condenser air ducting and are ideal for enclosed spaces where you cannot discharge the condenser heat. Alternatively, the rejected heat is transferred through the water leaving the condenser coil to a drain. These units are most cost effective to operate where there is a central chiller plant. Republic delivers comfort when you need it.